England's First Citizen Army, newly arrived in France, in co-operation with a French Army, received its baptism of fire in that pitiless five-months' struggle in Picardy known as the First Battle of the Somme. For sheer waste of men, blundering tactics and the inefficiency of the lesser officers commanding, this battle holds a unique place among the more tragic encounters of the World War. The Battle of the Somme, which opened on July 1, 1916, had for its principal object the reduction of the German salient at Noyon, whose apex projected westward to within 50 miles of Paris. Its secondary object was to relieve the pressure upon the French at Verdun by compelling the Germans to transfer a considerable force from that theater of war to the Somme. The battle was fought on a 30-mile front, bounded by the Rivers Ancre and Somme, the British holding 20 and the French 10 miles of the line. The immediate objective of the British was Bapaume; that of the French, Peronne. The Allied forces numbered 1,500,000 men and the Germans 1,300,000. After the range of the German trenches had been found by the Allied airships, there was launched on June 28, 1916, a most terrific artillery bombardment, which continued incessantly for four days and nights, rising to a hurricane pitch of fury. It was only partially successful, for the Germans had built themselves perfect protection from shell-fire in the form of large bomb-proof dugouts, deep underground, each dugout capable of sheltering hundreds of soldiers. Here they could rest secure, and when the bombardment had ceased, haul out their machine guns and await the advance of the enemy. At daylight, on July 1, 1916, the artillery laid a barrage behind the German line, and the British and French went "over the top" along the 30-mile front, expecting to find the German trenches in ruins and the Hun Army demoralized. Never was there a greater delusion and never did such swift disaster fall upon an army as that sustained by the British left wing from Gommecourt to Fricourt. All unaware of the German Army hidden in deep dugouts, the British left wing on a twelve-mile front went gallantly forward, wave after wave, until they had passed Thiepval. Suddenly, from a thousand dugouts, the German soldiers emerged, taking the Britishers in the rear with the fire of their machine guns and cutting them down like grass. Some British regiments were caught between two fires, cannon assailing them in front and machine-gun fire from the rear. They fell by thousands. Fully 50,000 Britishers perished on that fatal day. At dusk, when the barrage fire ceased, the survivors crept back to the British lines. The right wing of the British advance, meanwhile, had escaped the fate of the left. Advancing on a four-mile front, south of Fricourt, they had penetrated into four parallel German trenches and captured the villages of Mametz and Montauban. The Germans fell back seven miles to La Boiselle, where they reformed, leaving 2,500 prisoners and numbers of machine guns with the victorious Britishers. La Boiselle was carried on July 5th and five days later Contalmaison was captured. General Haig, on July 14, 1916, ordered a general advance against the second line of German trenches, on a 12-mile front from La Boiselle to Delville Wood. The Germans yielded three miles of their line, losing 10,000 prisoners. A squadron of British cavalry, under General Allenby, participated in this engagement for the first time since the armies had occupied fixed positions. A week later, the French extended their partial six mile advance along their entire front. The veteran French troops, meanwhile, under General Fayolle, with highly trained artillerists, swept the Germans before them on a ten-mile front south of the Somme, taking 12,000 prisoners in ten days, capturing a score of villages and gaining all their objectives. When within sight of Peronne and Combles, having then advanced six miles, they halted to enable the British right wing to overtake them. For five weeks, from July 14, 1916 to August 18, 1916, the German third line of trenches along the slopes of the Pozieres Ridge was stormed. Step by step the British advanced, taking Ovillers-la-Boiselle, Pozieres and a part of the Delville Wood, but the Huns still hung to the higher ground between Thiepval and Fleurs, on a front of seven miles. Finally, by hurling 500,000 men against the ridge, the Allies took Thiepval, Martinspuich and Courcelette and pushed the Germans back to the low ground around Ancre Brook. On the east side of the ridge, another Allied Army took Delville Wood, Fleurs, Combles and approached Mont St. Quentin, the key to Peronne. 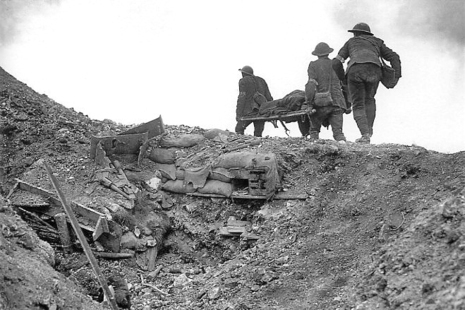 The German line had been breached in several places and broken on the front from Ancre to the Somme. 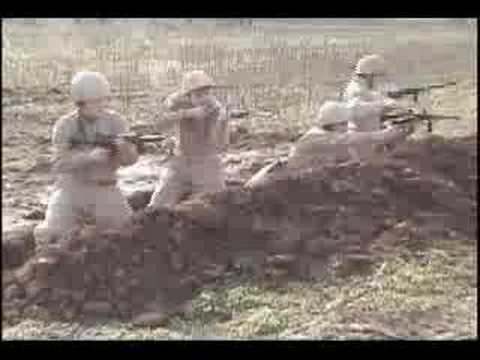 The Huns were now fighting in quickly dug trenches, barricaded villages, shell holes and mine craters. They had suffered enormous losses under the constant pounding they had received, and the Allied losses were scarcely inferior. During this battle of Pozieres Ridge, the first great aerial battle was fought between the British, French and German airplanes. The British had gained the supremacy of the air, chiefly by mobilizing their planes. The Germans, who had hitherto used their planes individually for scout work or bombing purposes, now assembled several squadrons and contested the air field with the British and French. Early in September, 1916, occurred the first great air battle of record, when 42 planes belonging to the three contestants were destroyed in a spectacular combat over the ridge. 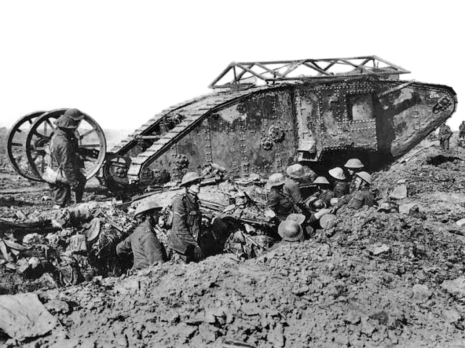 The greatest military innovation of the War—the British armored chariots, familiarly known as "Tanks" — made its first appearance September 14, 1916 on the Somme battlefield, and was first employed in the engagement at Courcelette. This invention, ascribed to Colonel Swinton of the British Army, was an adaptation to military purposes of the familiar caterpillar tractor, invented by an American and long used in the United States. Moving clumsily, but with irresistible force, it could span the trenches and mine-craters, shatter trees like pipe- stems, trample down the most intricate barbed wire entanglements, crush down the walls of houses, and pierce the strongest lines of defence. Practically impregnable to ordinary gun fire, it was a movable fort, within which the gunners might direct a close range fire at the enemy. At Courcelette, where 24 of these tanks first were put to effective use, many of the Germans fled in terror at sight of the mechanical monsters, while others surrendered. With the aid of these tanks, the Canadians and British forced the Germans back two miles on a front of six miles. A wedge was then pushed in the German line between Peronne and Bapaume and several thousand prisoners were captured. Combles was evacuated on the September 26, 1916. The tanks had but a limited use in 1916, as the near approach of the winter season, with its mud and overflows, soon put an end to operations on the Somme front. After the seizure of Thiepval by the British, in a battle marked by an intense artillery barrage, the lesser defenses of the Germans fell one by one during the month of October, but the German line remained intact. The final engagement of the battle of the Somme began November 13, 1916, when the British assaulted Beaumont-Hamel on the west bank of the Ancre, expelling the Germans from a strong position and taking 5,000 prisoners, besides numbers of guns. Winter had now set in, the rain was falling in torrents and the campaign along the Somme abruptly closed. 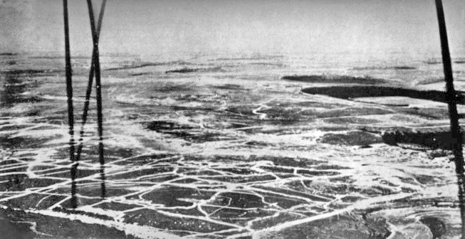 Excepting Verdun, and possibly one of the great Russian offensives, the first battle of the Somme was unequalled in point of duration, numbers engaged and the extent of the casualties. The battle covered a period of five months. Over 3,000,000 men faced each other in that titanic struggle. The casualties were unparalleled. The British and French allies together lost 675,000 men and the Germans, 700,000. The Allies, moreover, had taken 80,000 German prisoners. The Allies had accomplished their double purpose. Though their set objectives at Bapaume and Peronne had not been attained, they nevertheless had smashed the supposedly invulnerable German line and relieved the German pressure on Verdun. Advancing seven miles beyond the German trenches, they had recovered 200 square miles of French territory. Above all, the new British Army, from a body of raw volunteers, had developed into an army of veterans able to cope with the German war machine on equal terms at least. That part of Picardy in which the battle of the Somme was staged, once a vale of beautiful vistas, lovely villages and prosperous farms, was left a desert. The destruction in Picardy excelled anything hitherto known to warfare, even that of Belgium and Poland. Throughout the battle area, ten miles wide by twenty miles long, all was devastation. The face of Nature had been seared and pockmarked by the deluge of shells and bombs. All vegetation had been destroyed. No woods remained. Villages were obliterated. The ground itself, swept by fire and gasses, was poisoned beyond recovery. Yet that same field was to be the scene of two more terrific battles in 1917 and 1918. The Germans, saved from utter defeat by the torrential rains, at once reorganized their armies on the Western front. General Eric von Falkenhayn fell from grace and was superseded as Supreme Commander by General von Hindenberg, who chose his former Chief of Staff, Gen von Ludendorf, as his Quartermaster General. Hitler served in France and Belgium in the 16th Bavarian Reserve Regiment (called Regiment List after its first commander), ending the war as a Gefreiter (equivalent at the time to a lance corporal in the British and private first class in the American armies). He was a runner, one of the most dangerous jobs on the Western Front, and was often exposed to enemy fire. He participated in a number of major battles on the Western Front, including the First Battle of Ypres, the Battle of the Somme, the Battle of Arras and the Battle of Passchendaele. 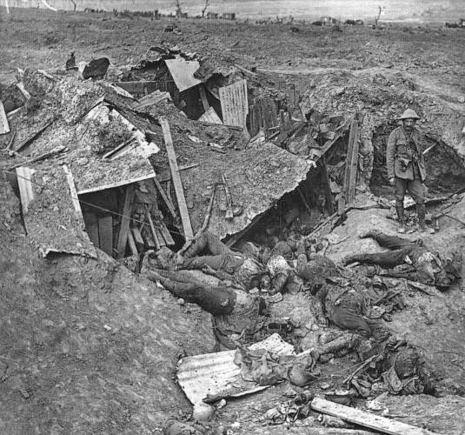 The Battle of Ypres (October 1914), which became known in Germany as the Kindermord bei Ypern (Massacre of the Innocents) saw approximately 40,000 men (between a third and a half) of the nine infantry divisions present killed in 20 days, and Hitler's own company of 250 reduced to 42 by December. Biographer John Keegan has said that this experience drove Hitler to become aloof and withdrawn for the remaining years of war. The Battle of the Somme (French: Bataille de la Somme), also known as the Somme Offensive, took place during the First World War between 1 July and 18 November 1916 in the Somme department of France, on both banks of the river of the same name. The battle consisted of an offensive by the British and French armies against the German Army, which since invading France in August 1914 had occupied large areas of that country. One of the largest battles of the First World War, by the time fighting had petered out in late autumn 1916 more than 1.5 million casualties had been suffered by the forces involved. It is understood to have been one of the bloodiest military operations ever recorded. In July 1916 The Battle of the Somme, where nearly 20,000 British Soldiers died on its first day, soldiers in their thousands were wounded, 57,000 casualties on the first day. Home interest in the Battle was intense. Almost every family in the land knew someone fighting in the Somme. It was a long time before the truth about the Somme slaughter began to appear in the newspaper columns of casualties. Whole pages were grey with hundreds of names, column after column of dead soldiers. British families were all in mourning, grief-stricken by the news. Rotherham became a community suppressed in grief and deeply saddened pain. Whole streets had drawn blinds, and flowers were laid in memory of the dead and wounded soldiers, with the battle to rage until November of that year. Tending men with terrible wounds and young soldiers with the effects of poison gas was difficult nursing. As their battle scars healed their mental scars would run much deeper. These men who bared their souls for battle, anticipating their fate without any question, were now left with much time to reflect on all the mutilation of battle. They had seen friends bodies ripped apart in battle, and their fate pulled into question while the smell of death was all around them. Helping to heal these haunting memories were as much part of nursing as treating their open wounds. During its first year of opening, 450 soldiers received treatment at the hospital. Most men despite their wounds and haunting memories remained cheerful throughout their stay. Life in Oakwood was made as comfortable as possible for the men.